Efficient and accessible use of space is a great benefit when working in a kitchen. 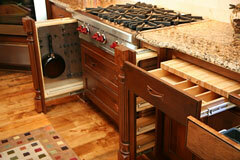 Today's kitchen cabinets are designed to meet a variety of these storage space needs. The interiors can be accessorized so that even the smallest nooks and crannies are usable. Kitchen pantry cabinets are an excellent way to integrate a custom look in your kitchen. These pantry options often have units that slide or fold out and are best for dry goods or canned goods. 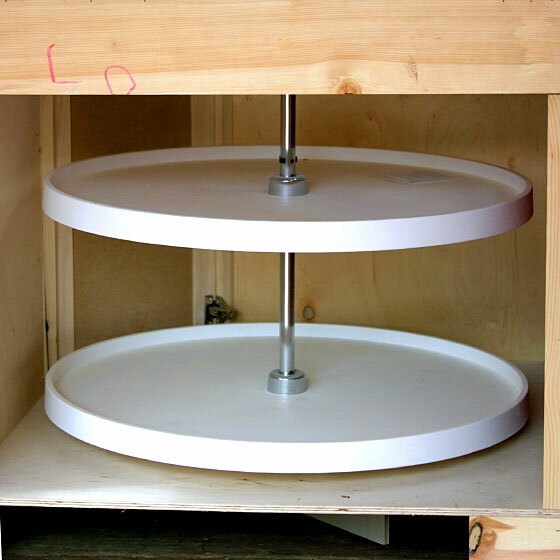 They may be either full height or fit into a base cabinet. One of the common problems in a kitchen is what to do with dead corner space. Corner cabinets are available to use this space to advantage. Lazy Susans in the corners are a wonderful way to store pots or products that you need easy access to. There are also corner cabinets with shelves that turn and slide out. These corner storage options are available for both base and upper cabinets. Appliance garages similarly use dead space on the countertop. Hide several small appliances for a cleaner look. Outfit a deep cabinet over your refrigerator with upright dividers to slot in trays, cookie sheets, roasting pans, and large cake pans. This will eliminate the need to stack them, and you can easily pull out the one you want to use. Put a tilt-out tray in front of the sink for scouring pads and sponges. Slide out trays or bins make it easier to access base cabinets. Or a spring-loaded shelf that swings out and up from a base cabinet is a great way to access and use a heavier stand mixer. Use dividers in drawers for silverware, baking spoons and equipment, and other kitchen gadgets. A drawer fitted with a slotted wood holder will protect the blades of knives. Other organizers might include bread drawers, spice storage racks or drawer inserts, and built-in plate racks.